On December 14, the peace and innocence of Newtown, Connecticut was shattered and 26 people lost their lives. 20 of which were dear, sweet children. I have no words. Now the students and faculty of Sandy Hook Elementary School are preparing to begin classes again in a new location. 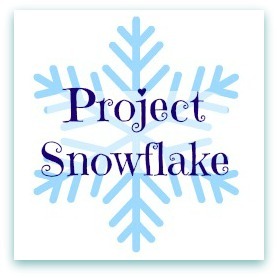 To ease their return, the Connecticut PTSA has organized The Snowflake Project to create a winter wonderland in their new school. I think this is a wonderful idea and I am so happy to be able to do something - anything - to help. So who is with me? Let's get the word out and give these kids a gorgeous, snowy wonderland to welcome them to their new school and show them that we care. They are asking for everyone to make and send snowflakes for them to hang around the school. Their only request is that the snowflakes have no words on them. Think bright, sparkly, happy, and magical! You can check out the CT PTA website or Sandy Children Help on Facebook for more information or updates. They are also putting together a photo album of the snowflakes; you can send photos to crafts4newtown@gmail.com. Please include a note to let them know where the snowflakes are coming from (school, grade or age, town etc). So grab the button, spread the word, and get creating!! And make sure to come back on January 9th for a Project Snowflake linky party. The response to an initiative by Newtown PTAs and the Connecticut PTA to create snowflakes to decorate the Chalk Hill School in Monroe, where Sandy Hook Elementary School students will return to school after the holiday break, has created a blizzard. So many snowflakes have been delivered to Connecticut, from all over the nation, that the PTA is now pleading for school children and others to please stop creating and sending the winter icons. "There is a semi-tractor trailer truck parked in Hamden [where the Connecticut PTA is located] to store all of the snowflakes ," said Middle Gate PTA President Kelley Mozelak, "and it's full." The original idea had been to find a way to give children a way to support the children of Sandy Hook School and to help decorate the hallways of the new school, Ms Mozelak said. The local and state PTAs are extremely grateful for the participation, she said, and look forward toward a day in January when they will be able to decorate Chalk Hill School with the many snowflakes they have received.